A trailer is out for Patricia Rozema's dystopian drama Into the Forest. Ellen Page and Evan Rachel Wood star in this stunning new film from the Canuck director. Forest sees Rozema adapt Jean Hegland's novel about two sisters who endure the elements when society collapses. The film opens in Canada June 3 from Elevation Pictures. 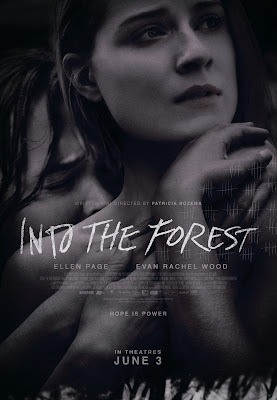 I caught the film during its Canada's Top Ten run this January and am a big fan of Into the Forest. It's easily my favourite film among the Canadian releases this year, so it's one to catch if you can. Review: There’s an air of Margaret Atwood, too, to the rich dystopian atmosphere that uses the pull of the wilderness and a strong feminist energy to engage the viewer in a compelling parable of survival. This adaptation from the book by Jean Hegland firmly puts Rozema in Atwood territory and the director’s a perfect fit for the material. Into the Forest sees Rozema in her element as she devises a powerful, lyrical film driven by the resilience of two women. The film is Rozema at her best and arguably one of her most visually and thematically satisfying works. She lets the actresses be commanding vessels for this tale of sisterhood and rebirth. Read the full review here.